Procrastination just doesn’t feel good. Period. Right now, just think about something you’re avoiding doing. How does it feel when you think about what you’re not doing. If you’re like most of us, thinking about what you’re not doing, but should be doing, can trigger feelings of guilt, anxiety, and lots of self-judgement. Problem is, when you get mired all those negative feelings, it’s difficult to get anything done! What’s important is getting clear about the reason why you’re procrastinating in the first place. Is it because you’re afraid of the outcome? Or that it’s too hard? Too complicated? Are you afraid of making a mistake? Are you afraid that you won’t succeed? Or that you will succeed? 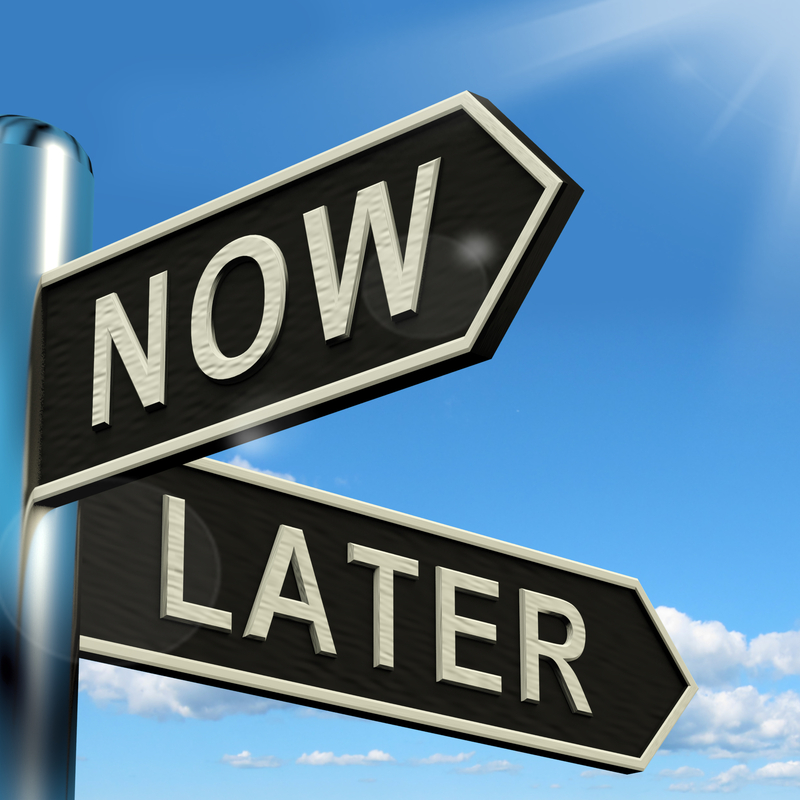 Most times, fear and uncertainty are underlying ingredients of procrastination. We avoid what we don’t know, what feels uncomfortable or scary. So get clear. Get clear about what you’re avoiding doing. Get clear about the feelings that get triggered because you are procrastinating. And, get clear about the feelings you are trying to avoid by procrastinating. Focus on the benefits of doing the thing you’re avoiding. What would happen if you did it? How good would you feel? What else could you do as a result of taking this first step? Set your imagination free and imagine all of the good-feeling benefits you’ll experience once you take action. Start Small. – One reason we procrastinate is that we tend to look at the subject of our procrastination as if it’s a great big scary monster. It looks too hard, too complicated, too overwhelming, too impossible to tackle. So, to counter this tendency, look instead at the one small step you can take in the direction you’ve been avoiding. One small step, and then another and another, keeps you moving forward. That’s all it takes. Enrich Your Environment — Sometimes we procrastinate because we dread the experience of the task we’re avoiding. For example, you might dread paying the bills, doing your taxes, writing a report, doing household chores, etc. To make these tasks more enjoyable, enrich your environment with music or an interesting podcast, a special drink or treat, and even some aromatherapy. Or, take your work to a café, or a cooperative work-space. And be sure to get as comfortable as possible. Enrich your environment, and you’ll enrich your experience and your chances for success. You might even enjoy yourself! Let Go of Resistance — When we resist a specific action or activity, we’re vulnerable to making it feel far more difficult than it really is. By moving forward in non-resistance, we accept ourchallenges without making them harder. Not everything feels pleasurable. Some things feel uncomfortable and even painful. When we let go of resisting the unpleasantness of an action, we’re more equipped to handle it. Release Fear – Fear is probably one of the biggest underlying factors of procrastination. If fear is an issue for you, first get clear about the fear you feel when it comes to your procrastination. Once you’re clear about your fear, you can use EFT Tapping, Heart Breath, or deep breathing to help it release. Contact me for more information on using EFT Tapping and the Heart Breath. 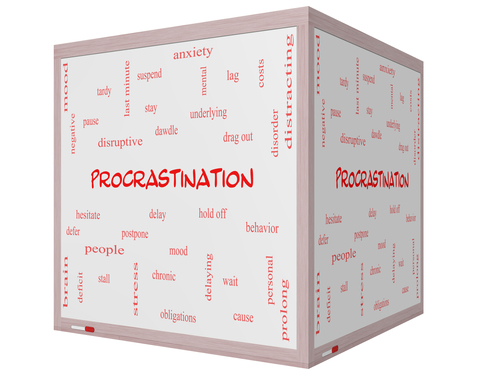 Click Here for a complimentary tapping audio to help you overcome procrastination. 3 Places Fear Loves to Hide & What to Do About It! Not only do we hide from fear, but fear also hides from us, waiting to pounce and sabotage our best efforts in business and creative projects. Here are some of the places where fear loves to hide. An all-time-favorite hiding place for fear. When a job or task feels scary, it might feel easy and even natural to avoid it. Unfortunately, habitual avoidance = procrastination. Procrastination takes you on the ultimate guilt-trip. We blame ourselves for being lazy, and this feeling of laziness leads to more of the same. A soul-sucking cycle for sure. Instead, what if the next time you find yourself procrastinating, you simply take a moment to notice what you’re feeling inside. Take a look at the activity you’re avoiding. Ask yourself why you’re avoiding it. Notice any fear that arises. Next, try one of the methods listed below to help calm your fear. Busyness may seem like the opposite of procrastination, but not always. Keeping yourself overly busy, with tasks unrelated to your creative projects, might mean you’re avoiding something scary. It can feel very scary to expand our talents and creativity. Conversely, it can feel much safer to keep busy with busywork, volunteer work, housework, etc. And then, before you know it, there’s no time left over for your dream. The next time you find yourself busy with everything but your business or creative work, get clear on what you’re avoiding. Decide upon one quick step you can take towards the project you’re avoiding. Build your momentum with quick, small actions that won’t stress your overly-busy life. How many times have you felt stuck in indecision, when it feels impossible to make the right decision? Or desperately muddled, unable to see any clear choice of action. It’s frustrating, for sure. It’s important to know that indecision often points to a fear of clarity. Or rather, a fear of what you know needs doing. Getting clear might mean making a scary decision, such as leaving a job, starting a new business, scrapping an idea, or taking some sort of risk. When you’re feeling besieged by indecision and anxiety about your next best steps, relax. Clarity comes most easily when you’re relaxed. When you’re feeling more relaxed, get clear on what you really want. Then take a step in that direction. Allow your intuition to guide you each step of the way. Try one of the techniques below to help yourself relax. Deep Breathing – Slow, deep breathing helps to oxygenate your blood, and facilitates better brain function. Deep breathing also helps stimulate the para-sympathetic nervous system, to create a calm state of being. EFT Tapping – EFT Tapping helps reduce cortisol, the major stress hormone released when we’re in fear. Using EFT tapping when you’re feeling fear, helps to reduce the intensity of the fear, and can often neutralize it. Click here for more information on EFT Tapping. To learn more about using EFT Tapping to reduce fear and anxiety, contact me. Heart Breath – The Heart Breath is another form of deep breathing where you imagine that you’re breathing in and out through your heart. It’s a fabulous technique to help you move out of a fearful, busy mind, into the wisdom of your heart. 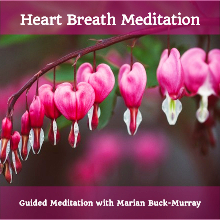 Click here for a free audio meditation. Find that fear, clear it, and do it anyway! Free workshop for solopreneurs, entrepreneurs, and creatives: Overcome Your Fear of Shining in Your Business, So You Can Do What You Love. Click here for the download.